The “Pixi” falls just under the calf muscle. The zipper comes down the inside of the foot with a short plain strap. The insole is removable which will provide extra room for the foot because there is padding built into the sole of the foot. 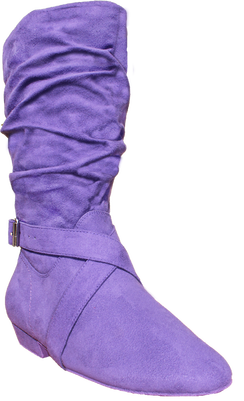 The boot is available in Black, Blue, Red. Tan, Grey or Purple Microsuede in sizes 5-12 medium and wide width with either a pro or flat heel.